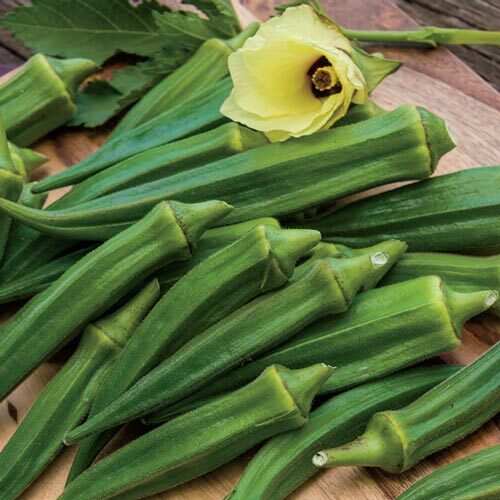 Emerald Green Velvet Okra | Gurney's Seed & Nursery Co.
Sturdy, 5–8' tall plants. Round, smooth, dark green, velvety pods stay tender up to 6–8" long. Cut cross sections are perfectly round and resemble little wagon wheels. 55–65 DAYS. Height5 - 8 ft tall. FruitGreen pods, should be harvested at 3-4 Inches. Soil RequirementsRich, well-drained sandy loamy soil. pH 6.0 - 6.8. CommentsRound, smooth, dark green, velvety pods stay tender up to 6-8" long. Cut cross sections are perfectly round and resemble little wagon wheels.